The Best Actor category in the 1970s is full of larger than life performances that commanded your attention. Perhaps in an attempt to balance that out, the Supporting Actor category went in the opposite direction, tending to honor more thoughtful and quiet performances. Understated is the key word here. Once again, it behooves me to remind you that I will comment on who should have won in each given year, but that cannot have any impact on the actor’s overall standing. Jason Robards is barely in Julia. Vanessa Redgrave and Robards won Oscars for playing the people who had the greatest impact on playwright Lillian Hellman: Redgrave as Julia, and Robards as her lover/mentor Dashiell Hammett. Julia inspires her humanity while Dashiell pushes her to greatness as a writer. The problem is, Julia is only peripherally about her writing. The title alone cues you to which side of the story is more important. Robards inhabits Hammett with instinctive depth and gravitas but never gets a chance to flex his muscles. It’s potentially a beautifully understated performance that never gets time to flourish. Should have won in 1977: Equus was a poorly made adaptation of the play but the performances were great, so Peter Firth. Robards’ role as Washington Post editor Ben Bradlee suffers from the same problem as Julia: he’s not that present. As Woodward and Bernstein investigate Watergate, Bradlee hums about the periphery. Robards does make a better impact with his screen time better than he did in Julia–perhaps because Bradlee feels more consequential to the plot here. Robards plays it without a flourish, just the pride of a career newsman dedicated to seeing the truth come out. He’s masterfully understated. It’s also notable that Robards made himself available for the duration of the shoot because he thought it was important for Bradlee to be ‘working’ in the background of the newsroom–even in scenes he wasn’t in. Should have won in 1976: Peter Finch won Best Actor for Network in what is actually a supporting role, so I would move him to this category and take the title from Robards. George Burns and Walter Matthau are bitingly funny as former vaudeville partners who despise each other and have been asked to reunite for TV, causing old resentments to boil over. At least, that’s what the plot promises. What we get instead are Burns (a former vaudevillian himself) and Matthau expertly leveraging each other for a series of one-liners. The movie, adapted from a Neil Simon play, enjoys their banter so much that it forgets anything else. Burns is at the top of his game, but he’s not acting. He’s performing a set from his old bag of tricks. Significantly, Burns’ old comedy partner, Jack Benny, had to bow out of the film when he was diagnosed with terminal cancer. Matthau was his replacement. Some argue this gave Burns a sentimental vote as an extra nudge to the podium on Oscar night. Should have won in 1975: ’75 had a stacked roster of nominees, any of whom would have been better. I would go with the one who breaks my heart to this day: Brad Dourif in One Flew Over the Cuckoo’s Nest. The Paper Chase hinges on Houseman’s Professor Kingsfield. Students must get through him to become lawyers and achieve the success they crave. He is proper, fiercely intelligent, and unforgiving. Students who let him get under their skin won’t be long for law school, for if they can’t handle him they can’t handle Harvard Law itself. Houseman is implacable, steadfastly refusing to give the movie a big character-defining moment, and it wasn’t until I started typing this out that I realized that is his character-defining moment. He’s the stand-in for Harvard Law itself. You can’t humanize or explain him. Still, without more of an arc there’s no denying that Houseman’s metaphor of a role got outshone. Should have won in 1973: Jack Gilford would have been a better choice for Save the Tiger. His weary moral compass added depth and emotion to that movie, unlike anything Houseman achieved here. Being There is a satirical story about a simple, television-loving gardener (played by Peter Sellers) who somehow becomes an advisor to the president. He gets there with the support of Melvyn Douglas’ dying businessman, who takes great comfort in the gardener’s odd observations, which he contorts into having incredible depth. Douglas imbues his character with great dignity and humanity, while most would have wanted a dying millionaire to be showy in a Howard Hughes way. But I have a hard time getting close to any of the characters in Being There, and this is no exception. Perhaps it’s because the thick veneer of satire keeps you at arms length, perhaps there was a conscious decision to keep the audience at bay (watching a movie about a gardener who loves watching television). Regardless, it makes it hard to relate to anything–or anyone–in the movie. Should have won in 1979: Robert Duvall’s performance in Apocalypse Now is the opposite of understated, but I would challenge anyone to argue against it. To critique John Mills in Ryan’s Daughter is to feel like one of the townspeople preying on his disabled character, Michael. They treat him as a village idiot and mock him for their own entertainment. It’s mean-spirited theater. On the one hand, you could say that Director David Lean is condemning this. On the other hand, the plot itself reduces Michael to a type: the ‘other’ who advances the plot, a sort of court jester allowed to go places others can’t and thus see what they cannot. Armed with that information, it is up to him to bring about the tragedy in an attempt to gain love and acceptance–even if just fleetingly. So even the movie is culpable. And while Mills could never overcome the fact that his character is just a plot device, he does give Michael humanity. Mills seems to be doing everything he can to avoid letting Michael become a caricature, even as the movie conspires against him. Should have won in 1970: Mills deserved it. I have problems with The Deer Hunter. I think the structure is intentionally jumbled for maximum emotional devastation to the point where the storylines cease to make sense as anything but a handy visual for the Vietnam War being evil. In fact, it’s Walken’s storyline as Nick that strains plausibility the most. You see, Nick and his friend (Robert DeNiro) went to Vietnam dreaming of returning as heroes whether they lived or died. Instead, Nick loses his mind and imprisons himself in an underground Russian Roulette ring. Haunted by his promise to look after his friends, DeNiro goes back to Vietnam only to watch Nick kill himself. Walken does his best to make Nick’s narrative make sense (in the end, no one could). But he does stunningly capture the horror of the situation and how it transforms Nick. Should have won in 1978: Bruce Dern was also heartbreaking in the other emotional Vietnam movie to come out that year, Coming Home. But this award belongs to Walken. This is the King of understated performances in this category. Ben Johnson’s quiet dignity and sad eyes make the movie. The Last Picture Show is melancholy and Johnson’s aged Sam the Lion embodies that quite perfectly. Even when he gets angry, he doesn’t light a spark. But the movie depends on Sam, even though he’s not the main character. Once he’s gone, it needs him to haunt everything that comes after–leading Sonny to note “Nothing’s really been right since Sam the Lion died.” Mission accomplished. Johnson’s wistful humanity elevates the entire movie. Should have won in 1971: Johnson. The Godfather Part II was DeNiro’s first big movie, and he mostly speaks Italian in it with English subtitles. It would have been easy to do an impression of Marlon Brando in The Godfather since he plays a younger version of that character. Instead, DeNiro managed to add his own nuances and layers to the character while paying homage to what Brando built. Everything he does is recognizably Brando and recognizably DeNiro. That’s pretty incredible. He also does a pretty good riff on Michael Corleone’s saga, just condensed into the subplot of a single movie. He achieves so much in one performance. It was the perfect announcement to the world that DeNiro was a major talent who was going to be around for a long time. Should have won in 1974: It was all DeNiro. 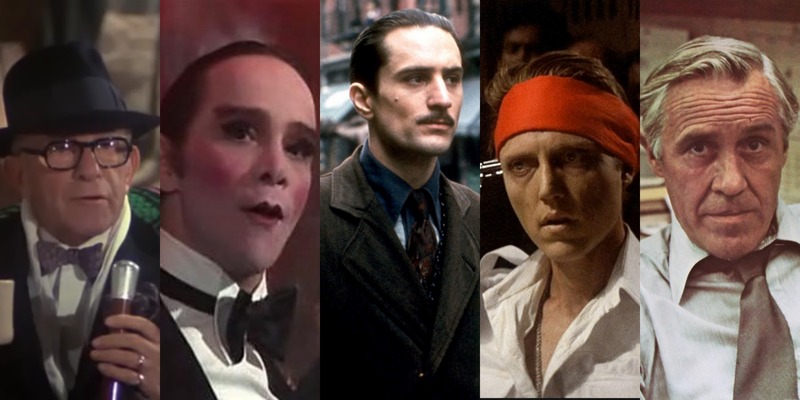 Simply put: Joel Grey is in a league of his own. There are no performances like his out there. You don’t know anything about the emcee in Cabaret, and you won’t get any more information about him by the end of the night other than the fact that he has a wicked, ribald sense of humor. He’s the ultimate enigma. Is he a mere performer? An opportunist? A villain? In the hands of Joel Grey it doesn’t matter. He’s captivating. Whenever he shows up, you can’t take your eyes off him. With every flourish, every stare, Grey draws you in. He attracts you, then repulses you. He makes an appeal for your emotion, then carelessly brushes you off. And you always want more. Grey does more with a single look than any other actor on this list. Should have won in 1972: Grey had incredibly stiff competition from not one, not two, but three actors from The Godfather: Al Pacino, Robert Duvall, and James Caan. Of those three, Pacino was the clear competition. I still choose Grey. Pacino was great in The Godfather but Grey did something truly unique. For more, check out my Academy Awards page. Up next, Best Supporting Actress of the 70s. I dislike characters that are plot devices and nothing but–when they have something more to offer, I can accept it. However; I would contend that the emcee in Cabaret is not a plot device since his character does nothing to advance the plot–if anything, he’s something of a distraction from it. He’s a fascinating character when you consider why, then, he seems so integral to the plot. That’s why I called him an enigma–you can see him as anything from a sideshow or a devil figure or even a symbol of the complacency and opportunism that allowed the Nazis to thrive. I like Grey’s performance because he captivates you even as he allows you to fill in the blanks with whatever YOU think his character represents. As for The Sunshine Boys, I double checked and you are correct that George Burns replaced Jack Benny, but Red Skelton was originally cast in Matthau’s part (Skelton dropped out once he realized he made more money doing stand-up than he would have made on the film).